Many of us have a limited data plan, and it is advisable in these cases to have some kind of control over our data consumption. 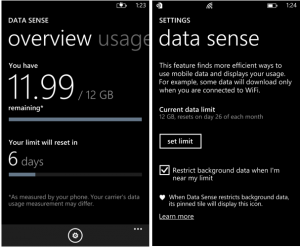 Windows Phone offers several options to restrict or limit the use of mobile data, so we won’t find a surprise on the phone bill. First, we must be sure to always use a Wi-Fi network if it’s possible. Thus, when we have an available network the phone will automatically connect to it and it won’t consume mobile data. 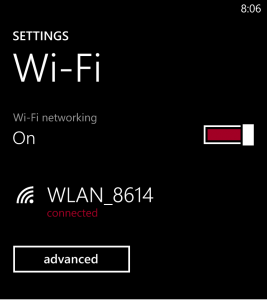 To turn the Wi-Fi on, we have to access to the “Wi-Fi” menu, that you can find in Settings. Once there, you can activate the Wi-Fi networks. Furthermore, we can configure the mobile network connection so the phone does not automatically connect to a mobile network when the connectivity to the Wi-Fi network is limited. 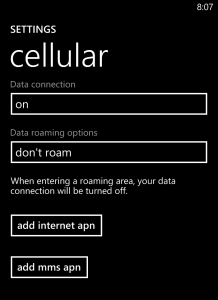 This feature, among others, can be set in the “Cellular” menu, in Settings. Some operators offer an app that lets us to limit the consumption of mobile data and offers information on the volume of the data consumed by the different applications that we have installed on our phone. The application is called Data Sense, and is very easy to use. We can find this app in the list of apps on our phone. When we access to it, we will see a Settings option, where we can set a data limit. This limit can be monthly, a fixed value or unlimited data. We choose the option that corresponds to our data plan and thus the consumption of mobile data will be restricted to the values we have assigned. This will prevent any surprises in the next phone bill. Data Sense also provides updated information on mobile data consumption as well as information in detail about all the applications that consume any mobile data.